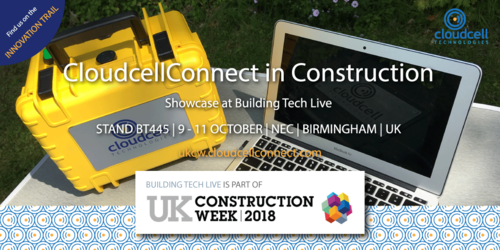 Winchester, United Kingdom, 5th September 2018: Cloudcell Technologies are pleased to announce that we will showcase the CloudcellConnect platform to the construction industry at UK Construction Week 2018, the UK’s largest built environment event. The CloudcellConnect platform enables construction firms of any size, to rapidly connect remote site and sales offices to a corporate network or the internet, and provide a remote site network and business telephone solution. To arrange a meeting at the show, or simply to discover more about CloudcellConnect in the construction sector, please visit our dedicated show microsite at ukcw.cloudcellconnect.com. Reliable: Our team of mobile experts use a range of class-leading antennas and network failover technology to maximise 4G speed and availability, keeping remote sites connected with confidence. Proactive: Remotely monitored and controlled through our industry-leading support portal, a construction firm’s existing IT Helpdesk staff have instant access to unique insights into performance and potential issues at remote sites, without the need for expensive site visits. Flexible: In addition to LTE and LTE-Advanced, CloudcellConnect supports alternative WAN technologies, including ADSL and Satellite, allowing a prioritised cascade of communication links, all managed through the same support portal, optimising investment. Rapid: CloudcellConnect installations can be completed in under 48 hours, connecting remote sites without unnecessary delay. CloudcellConnect is provided as a fully managed service. Cloudcell Technologies provide installation, full on-site support, firmware upgrades, reinstallation at a new site or decommissioning, providing ultimate peace-of-mind. Cloudcell Technologies are leaders in providing cost-effective, secure, reliable 4G connectivity in any location - urban or rural, on land or at sea. The CloudcellConnect platform from Cloudcell Technologies is a rapidly deployable business grade voice and connectivity solution for new, interim or mobile sites and offices; no office is too big or too small. CloudCell Technologies deliver best in class connectivity in less than 48 hours. This press release was distributed by ResponseSource Press Release Wire on behalf of Light the Fuse Ltd in the following categories: Public Sector, Third Sector & Legal, Computing & Telecoms, Construction & Property, for more information visit https://pressreleasewire.responsesource.com/about.